January | 2015 | Breathe. Sweat. Smile. Give the Gift of Health to the special man in your life this Valentines Day and earn $25 on your YBD account*. (*Recipient must use 5 classes within 30 days.) 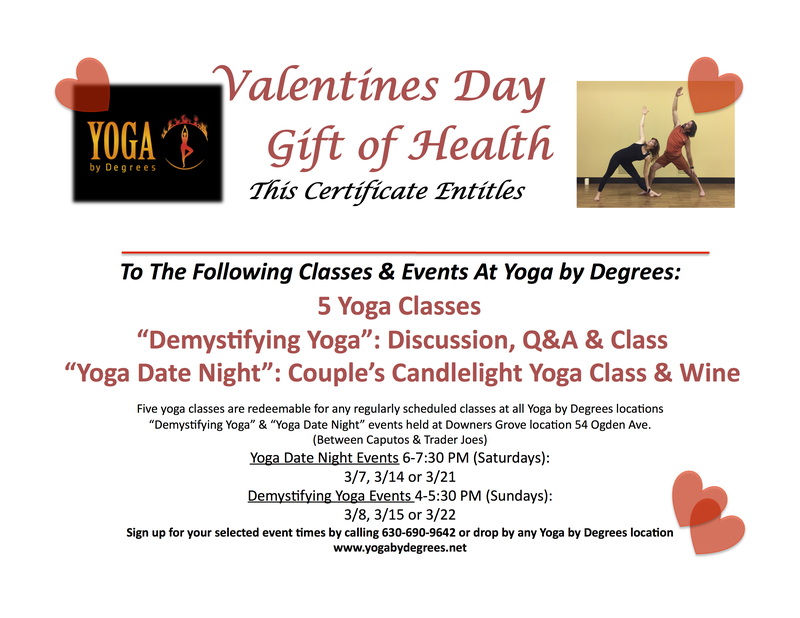 Scroll down for more information and then click here to purchase a Gift of Health Certificate Online for that someone special! January Pose of the month. Now that the new year has arrived we wanted to showcase a pose to begin the year with an open heart. Ustrasana aka Camel pose is our pose of the month. Here is Lara in a variation of that pose. Benefits of this pose includes. This pose is not for those suffering from high blood pressure or migraines. Patients suffering from insomnia should also avoid this yoga pose. This pose can cause serious back and neck injuries, so guidance from an experienced instructor is recommended. One thing to keep in mind in this pose is as you reach back avoid dumping into the lumbar spine by lifting up your chest as you reach back. Be sure to keep your hips in line with your knees. If you have trouble with this place your hips up against the wall to keep them in line with your knees. Meet Brandon, Teacher of the Month! Get to know our Teacher of the Month, Brandon! Brandon is a 200 hour certified instructor who teaches vinyasa and sculpt at our Wheaton and Downers Grove locations permanently, and he could be found subbing all around town. Brandon’s classes are lead with his powerful voice, intelligent sequencing, and thorough cueing. See below for more details! Yoga came to me, in my living room, on VHS tape. I started out a little over fifteen years ago with my mother. I was just going with the flow; fresh out of university and in need of fulfillment, I found myself signing up for a 200hr training. It was definitely one of the best decisions I’ve made. Peacock! Whenever I go out and get to talking with people they always ask me if I can do anything cool. I say, “Oh, you wanna see me Peacock?” That usually gets ’em. I am currently working on my one handed! I can draw inspiration from almost anything, but the reason I keep coming to my mat; the reason I speak to others who will listen is in hopes that maybe they too will hear, see, feel how beautiful the place we reside is. It’s a shame that we live on a planet where so many people take life for granted, but if I can help one person be reminded that this spinning rock is all there is to it, well, then that makes it worth it. There’s so much to be happy about when pain and suffering are removed. That love for being allowed to live in comfort is what inspires me; I listen intently to and try to share with whoever feels the same or wants the same.